Fiber Optic Connectors. ST, SC, LC, in both multimode and singlemode configurations. Great prices. 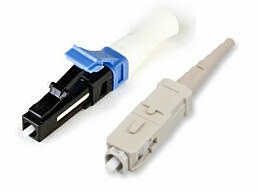 MT-RJ also included; male (pins) and female (no pins) style fiber optic connectors. UniCam Fiber Connectors do not require messy epoxies or polishing papers. With UniCam Connector technology one tool kit will install LC, SC, ST� Compatible. UniCam Connector installation is as easy as strip, clean, cleave, insert, cam and crimp. 3M No Polish SC and the new LC compatible connectors offer fast, on-site installation of 250 μm and 900 μm connections even when you don�t have access to power. Corning Anaerobic-Cure Connectors offer optical performance in a fast, easy field-termination solution designed for fiber-to-the-workstation applications for single-mode and multimode connections. 3M Hot Melt that can save time and energy using a special adhesive without having to deal with messy epoxy.